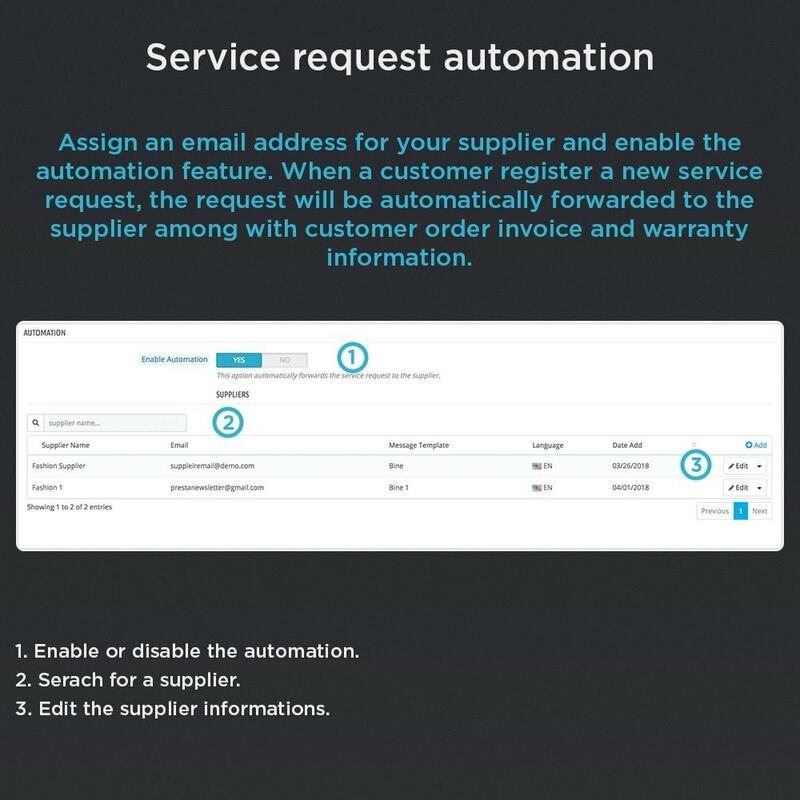 The merchant can check the serial number of the product and complete the service or send the request to the provider. You can exchange messages with the customer related to a warranty. Keep tracking of the warranties, add service revisions on them, send warranty as attachment. Managing warranty by adding a couple of statuses. Save time. Perfect workflow using AJAX, the browser doesn’t refresh because the most operations will run in background. Available for Multiple Stores configuration. 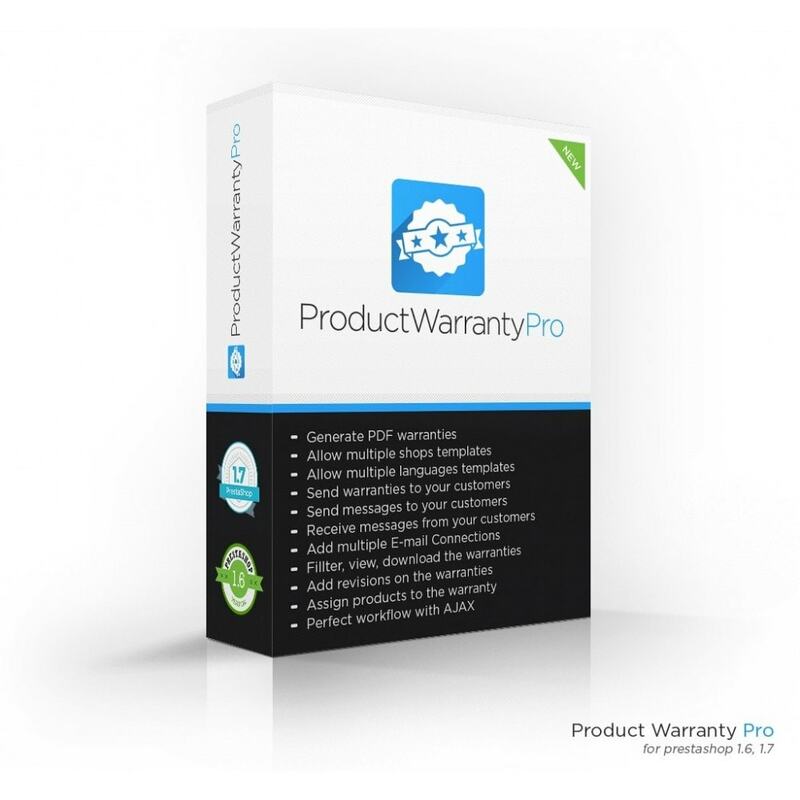 Generate a PDF warranty for each product that have one. Allow customers to view and download the warranties related to his purchases, as PDF file format. The customer can view the warranty expiration date and the time left of the warranty. The customer can send you a message to report problems of a product under warranty. The customer can attach files when he send you an message. The customer will receive and email with the warranty as PDF attachment. 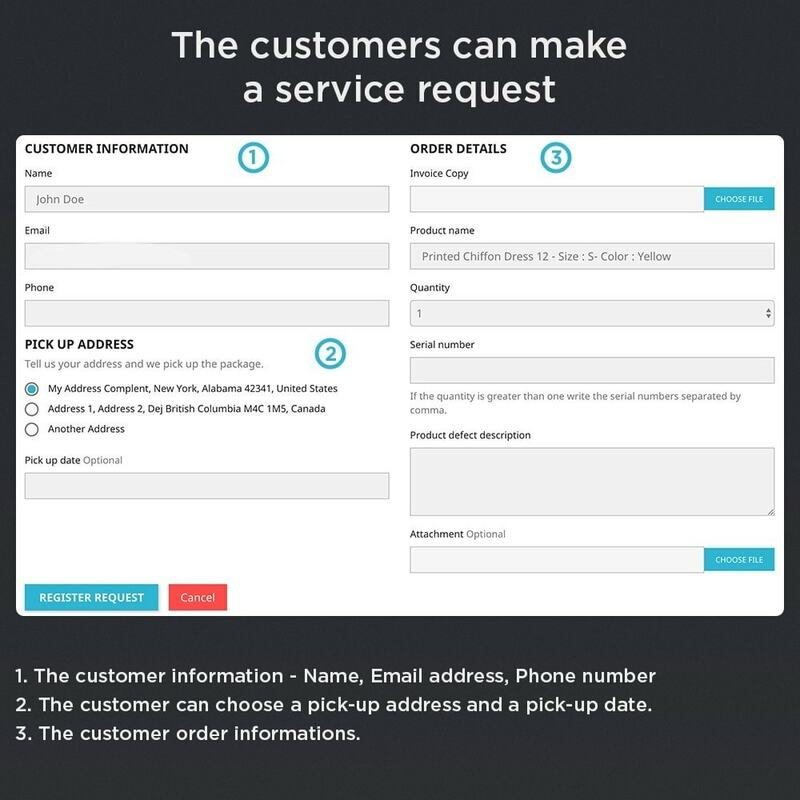 The customer can view the messages history under the customer account in the website front office. 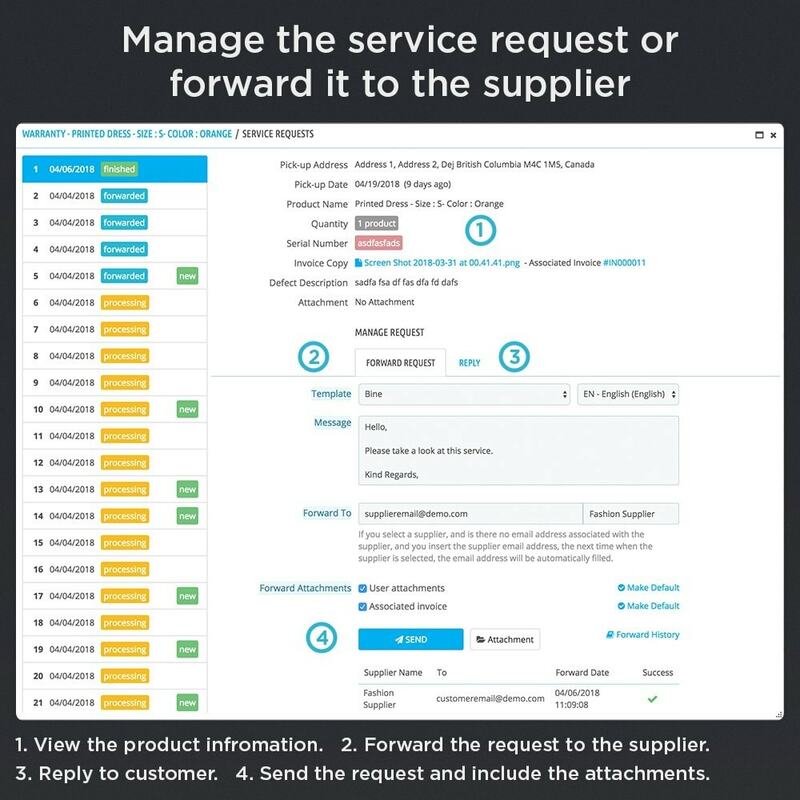 The customer can view and read the warranty revisions that have been made if the product have been sent to the warranty service. The customer can scan a QR Code on the warranty, that will point him to the warranty details. He can send you a message directly from that section. Associate an warranty time to the product. Example: 26 months, 3 years, etc. Choose a warranty time from a predefined list. Select an warranty template that have a different appearance. 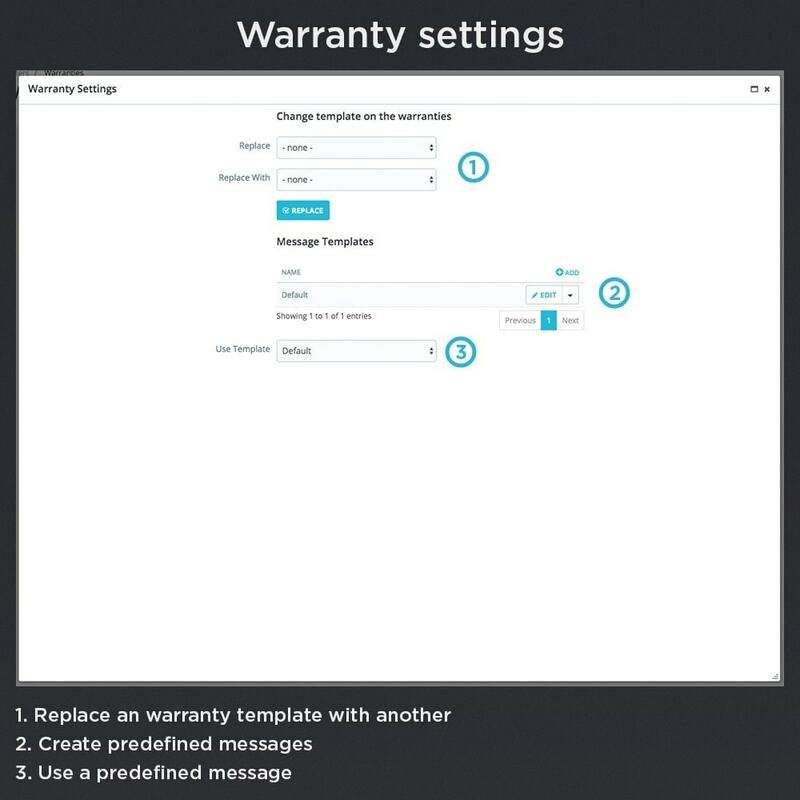 Preview the warranty template on multiple languages. View all the warranties associated the order. View the messages related to the warranty. View and download the PDF warranty. Validate the warranty and add serial numbers for each product on the warranty. Send warranty to the customer. Replay to the messages associated with the warranty. The attachment are allowed. Add revisions to the warranty. Inform the customer about a new revision that you have made. View all the warranties that are in revision. 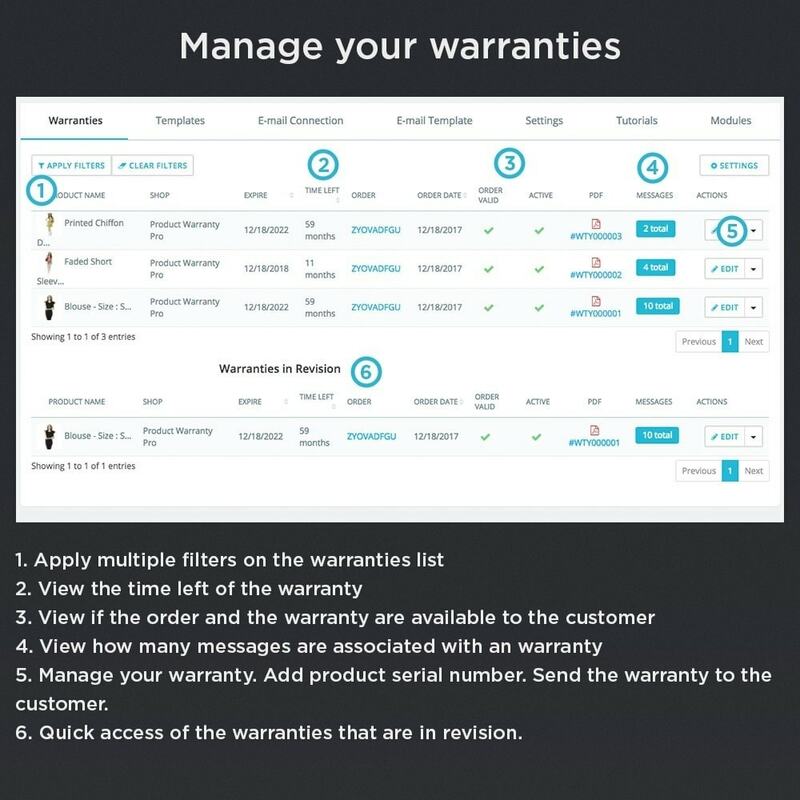 Filter warranties by: “Warranty Reference”, “Product Name”, “Shop”, “Customer Name”, “Customer Email” “Order Reference”, “Last revision Status”, “Used Template”. 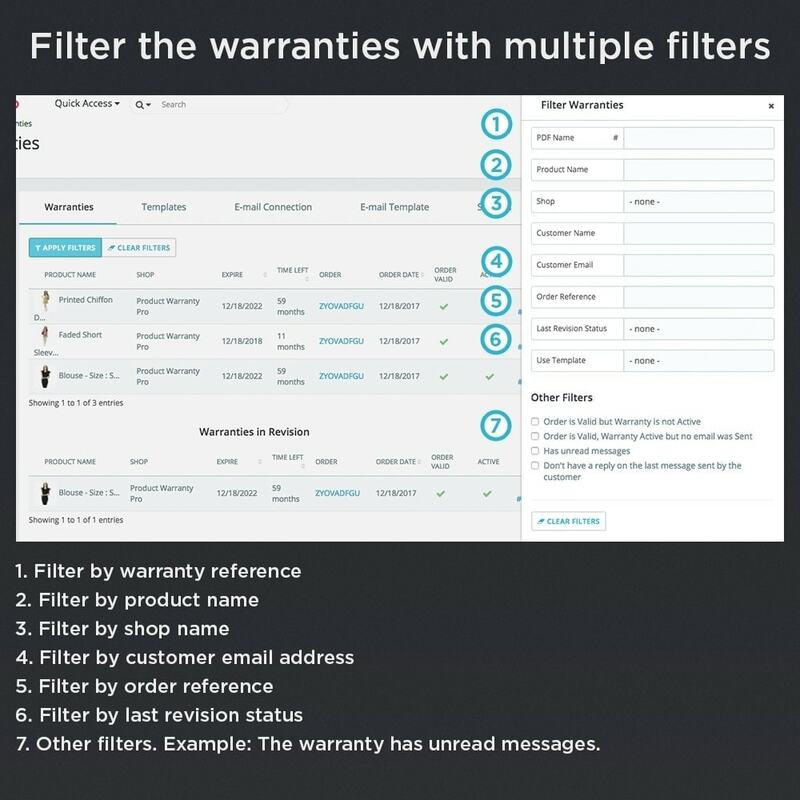 Filter the warranties that have an valid order but they are not active. Filter the warranties that are valid but you have forget to inform the customer about them. Filter the warranties that have unread messages. Filter the warranties that have new messages, and you have forgot to reply. View the product name associated with the warranty. Edit and View the warranty expiration date. View the warranty time left, or if it have expired. 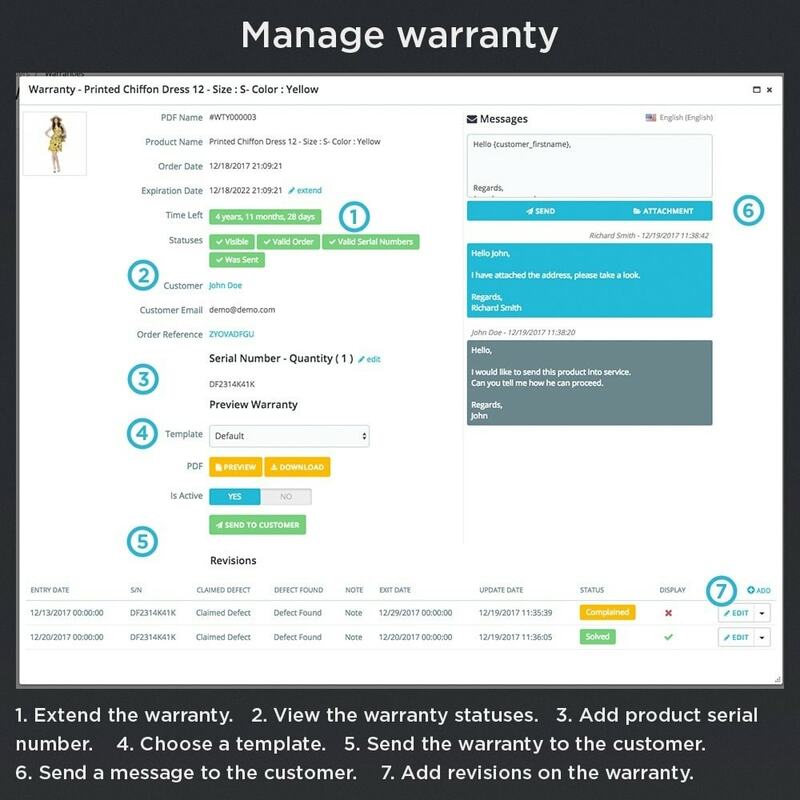 View the warranty statuses: “Visible”, “Order Valid”, “Product Serial Numbers are Valid”, “Warranty was sent to the customer”. View the customer name. You can access the customer page from here. View the customer email address. View the order reference. You can access the order page from here. Add / Edit and View the products serial numbers associated with the warranty. Choose a template for the warranty. 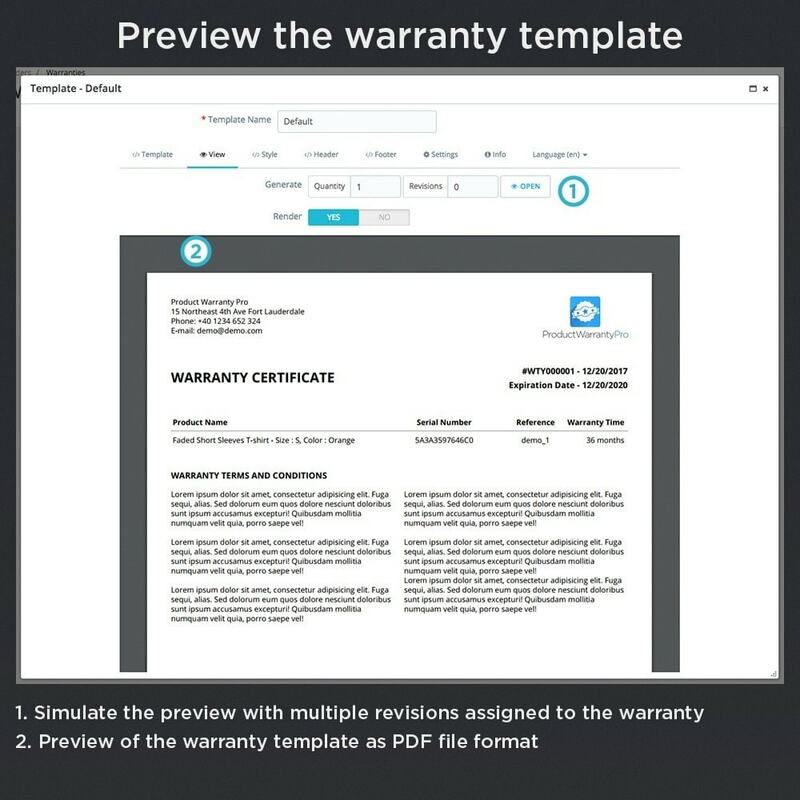 Preview and Download the warranty as a PDF file format. Enable or Disable the warranty. Send the warranty to the customer. Reply or send a message to the customer. File attachments are allowed. 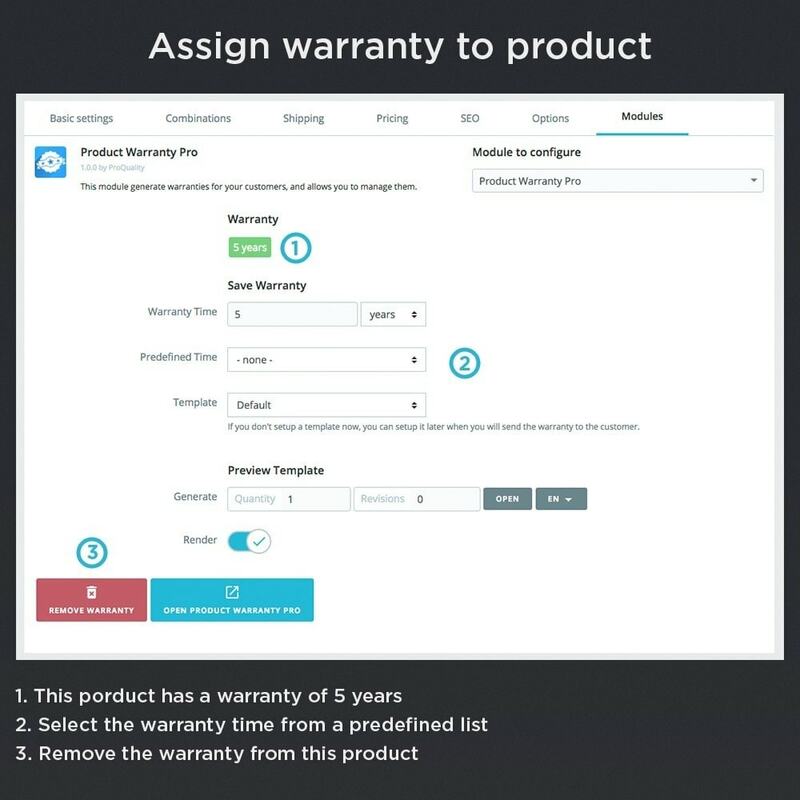 Add / Edit / Delete warranty revisions, when the customer send the product into the warranty service. Add the revision product entry date. Add the revision claimed defect. Add the revision defect found. Add a note to the revision. Add the revision product exit date. Add a private status, that allows you to manage the warranties under service. The statuses are “Complained” - when the customer report a problem, “Received” - when you have received the product, “In Service” - when you are working on the product service, “Solved” - if you have solved the product problems, “Delivered” - if you have sent the product back to the customer, “Refunded” - if you did not solved the product problems. Display the revision on the PDF warranty. Write a private note for the revision. Add warranty into the “Warranties in Revision” list. Replace templates associated with the warranties. 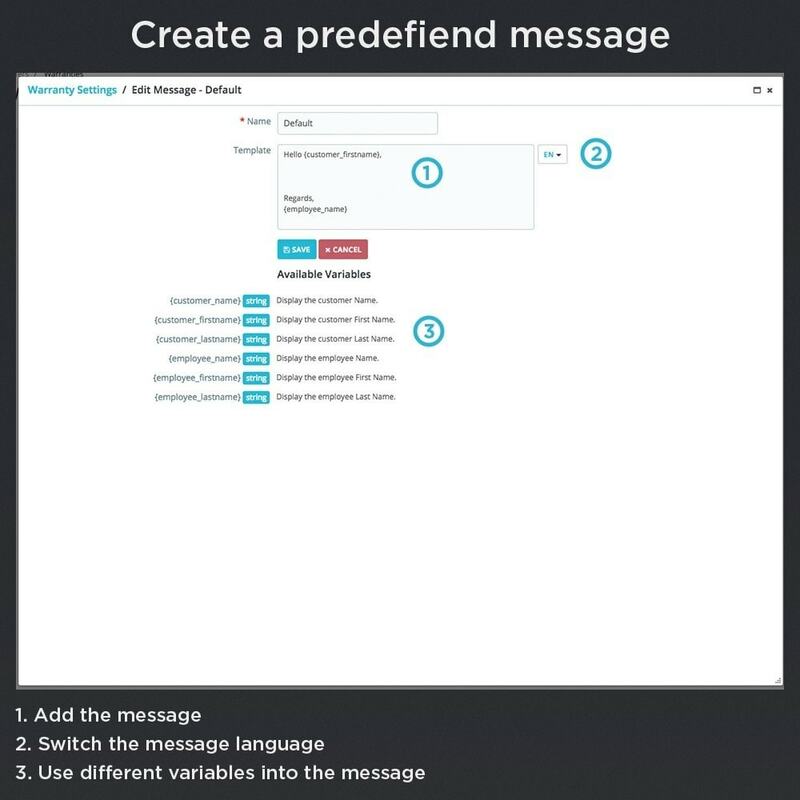 Create multiple messages templates that are available for multiple languages. Those templates are used when you communicate with the customer. Display the products with the serial numbers. Display all the revisions on the warranty. Display a QR Code that point the customer to the warranty detail section in the website Front-Office. 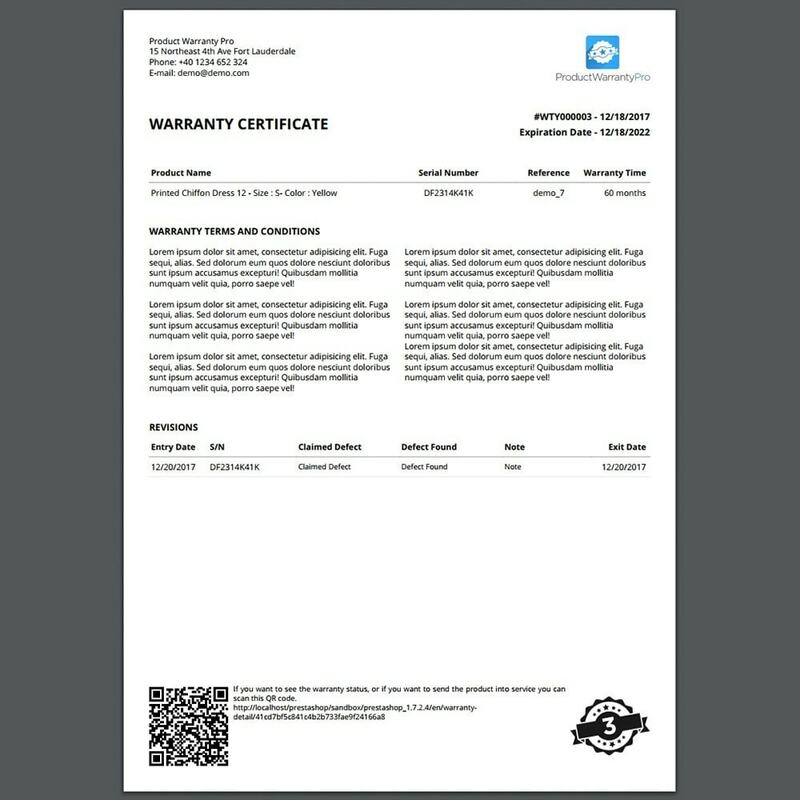 Display a signature or stamp on the warranty PDF file. Display an text, like warranty terms and conditions. The template are available for multiple shops. The template are available for multiple languages. Edit / Duplicate the warranty templates. 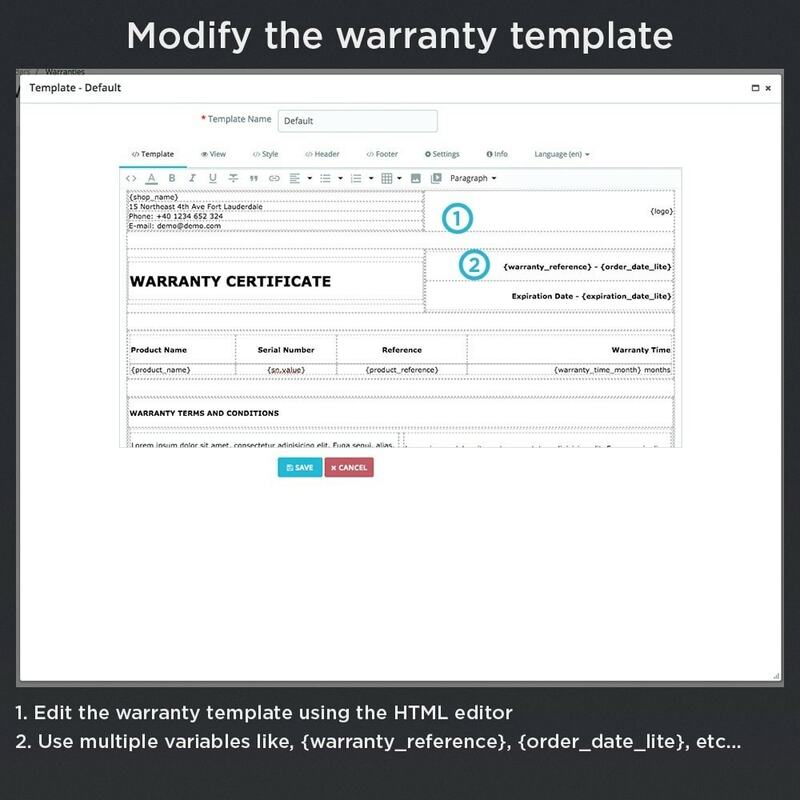 Edit the warranty template using the HTML editor. 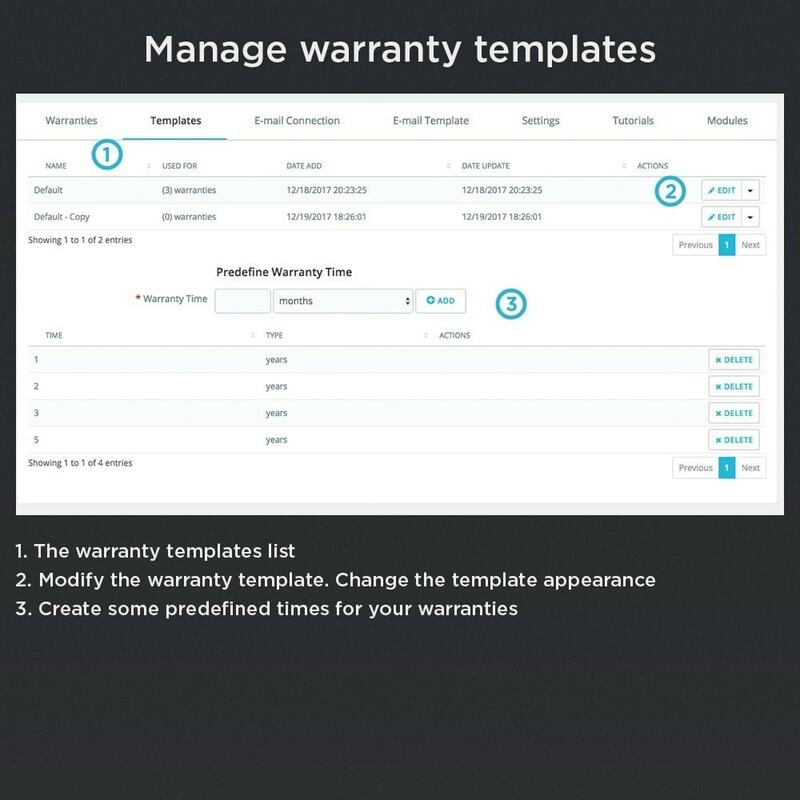 Preview the warranty template. 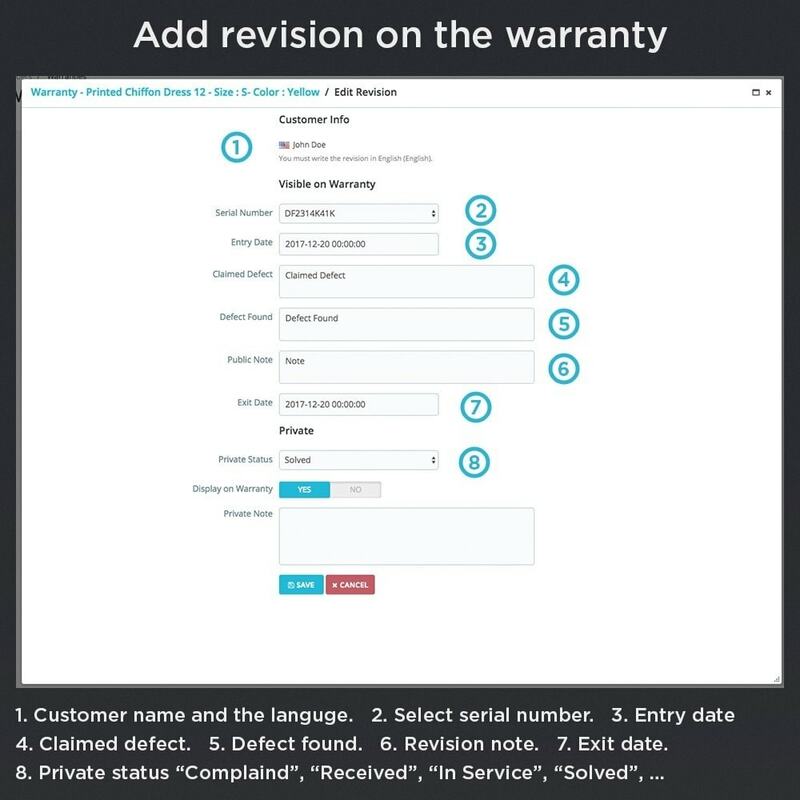 You can simulate a preview of a warranty that have assigned multiple revisions on it. Open the preview in a new window. 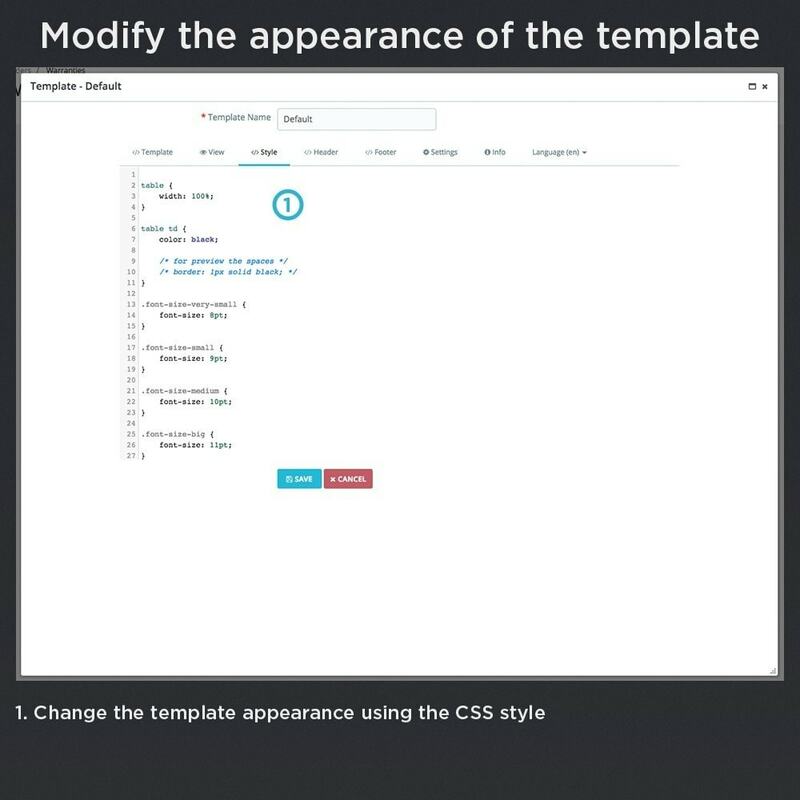 Add CSS style on the warranty template. Add Header and Footer on the warranty PDF file. 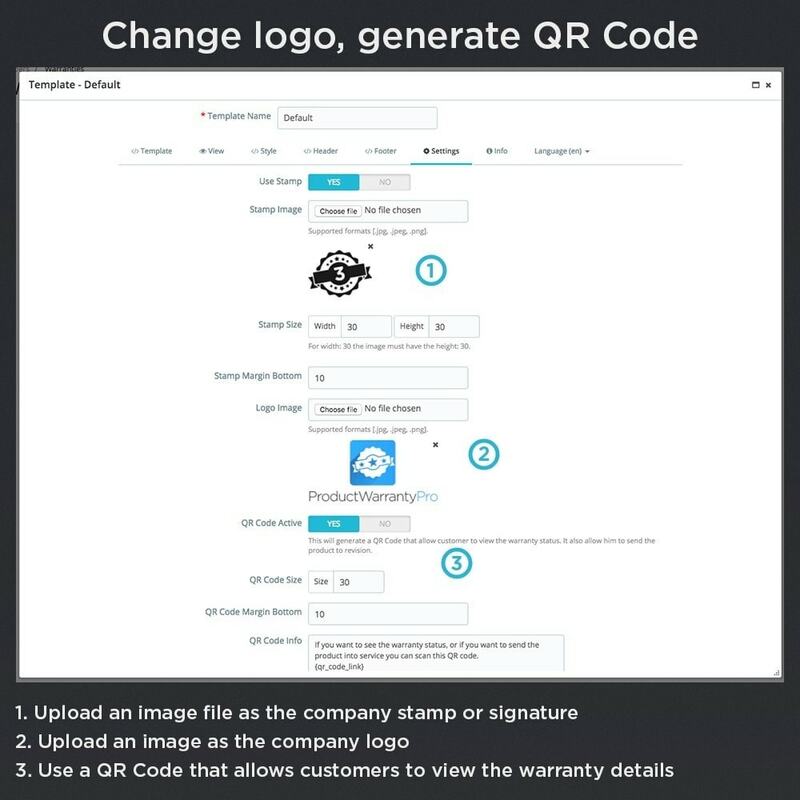 Add stamp or signature image on the warranty PDF file. You cam modify the stamp image size. 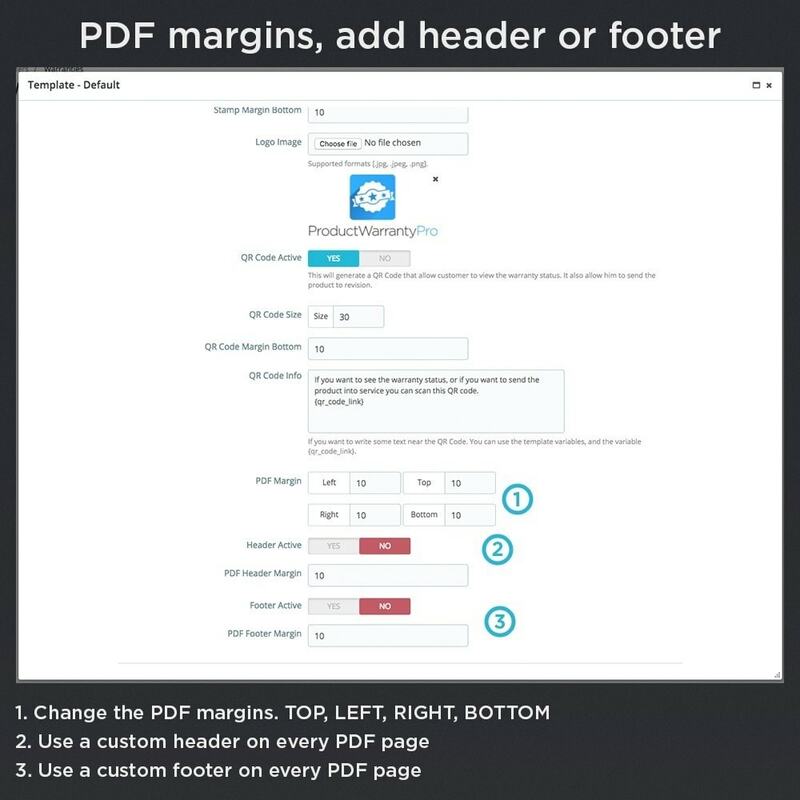 Setup the PDF margins “Margin Top”, “Margin Left”, “Margin Bottom”, ‘Margin Right”. Enable / Disable a QR Code. This QR Code will point the customer to the warranty details in the website Front-Office, and allows customer to send you a message if it have problems with the product. You can modify the QR Code size. Add some text near the QR Code. For example the QR Code link. Enable / Disable the warranty PDF header or footer. 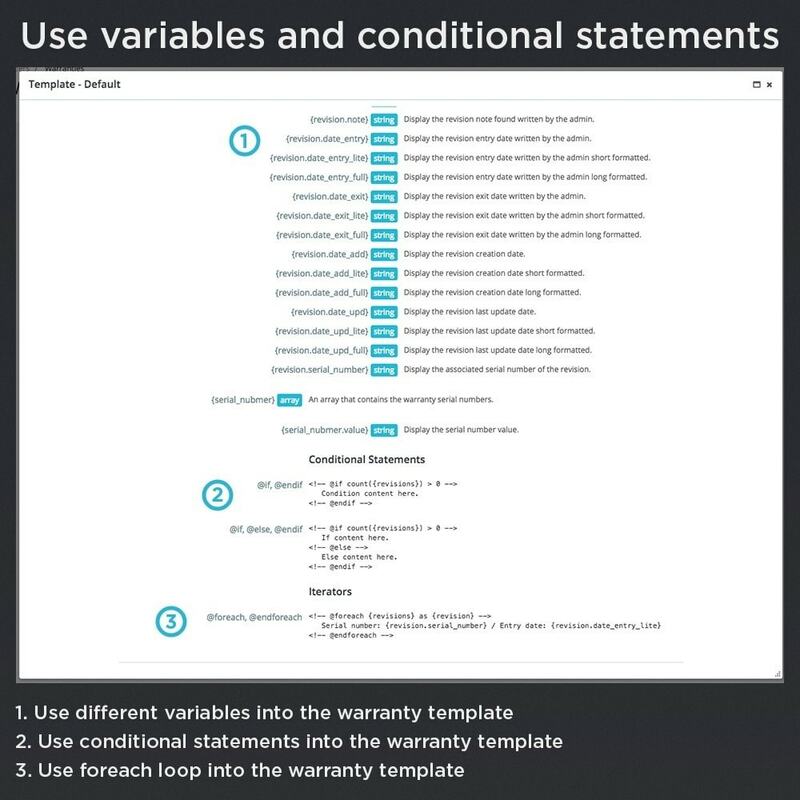 Use multiple variables on the warranty template. Example , , etc..
Use conditional statements on the templates. For example display or not the warranty revisions. Foreach iterator. For example if the product have a quantity grater than 1 you can display all the products serial numbers. You can use the predefined time under the admin edit product section. 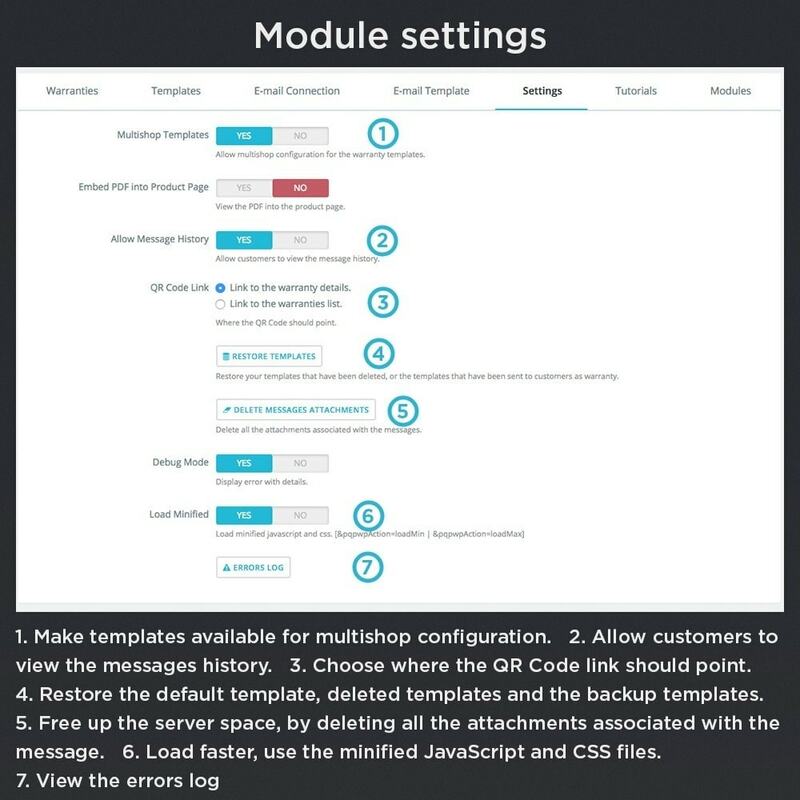 Activate the email connections or use the Default Prestashop email connection. Add / Edit the email connections. Setup the from name. The customer will view the Shop Name into the email message subject. 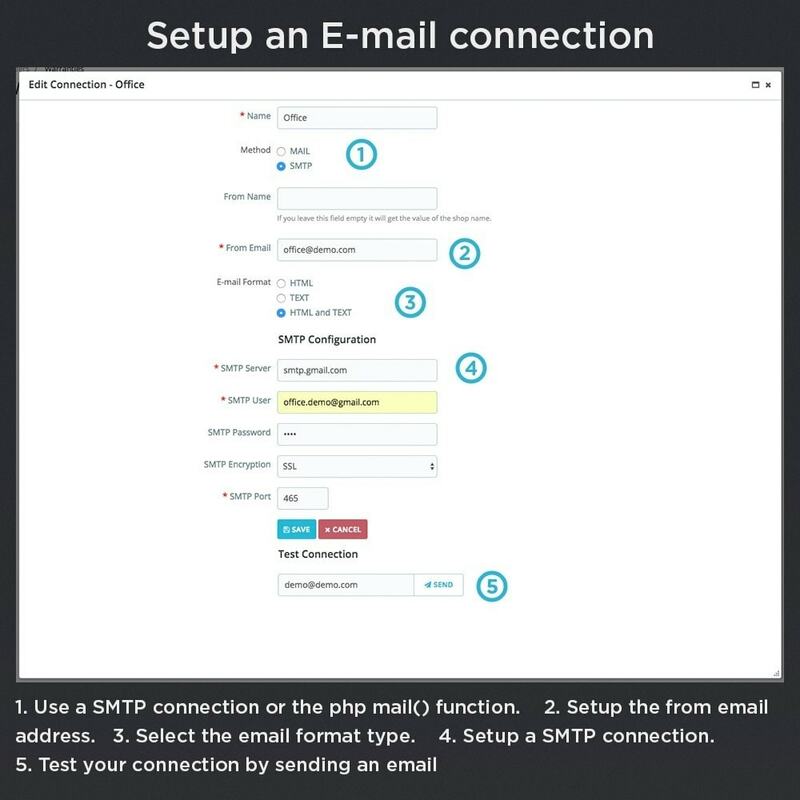 Setup a php mail() function connection. Choose the email format. “HTML”, “TEXT”, “HTML and “TEXT”. The customer will receive the email into the chosen format. 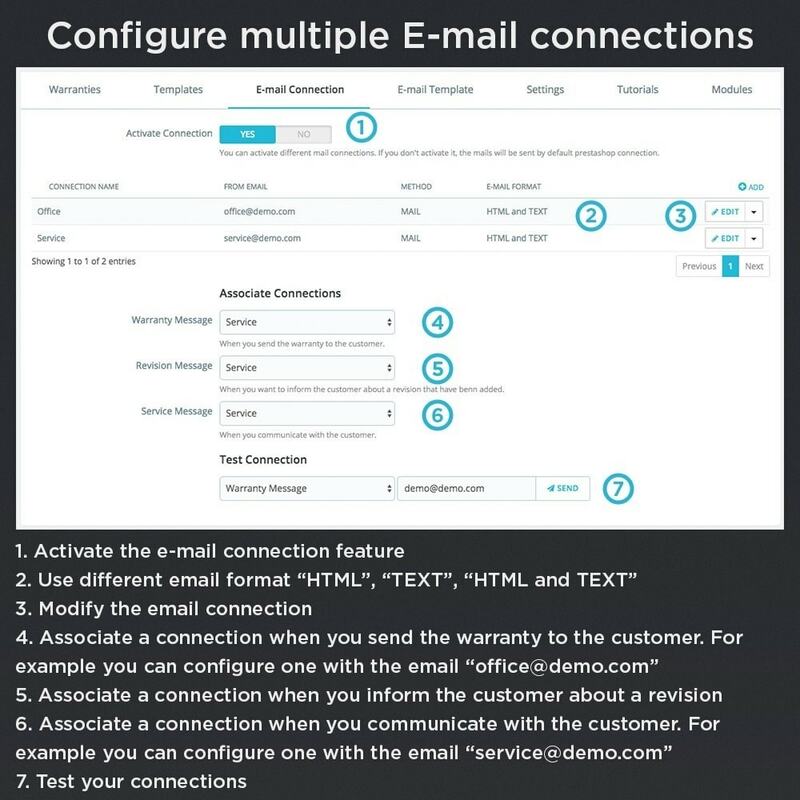 Test the email connection if it is valid or not, by sending an email. Associate a connection when you send the warranty to the customer. For example put the from email address like “office@demo.com”. Associate a connection when you inform the customer about a new revision that you have made. For example put the from email address like “service@demo.com”. Associate a connection when you communicate with the customer. For example put the from email address like “service@demo.com”. Test the associated connections by sending an test email. There are four email templates. “Warranty” - when you send the warranty to the customer, “Revision” - when you inform the customer about a new revision, “Message” - when you send a message to the customer. “Received Message” - when the customer sends you a message - it allows you to open the order directly from your email address. 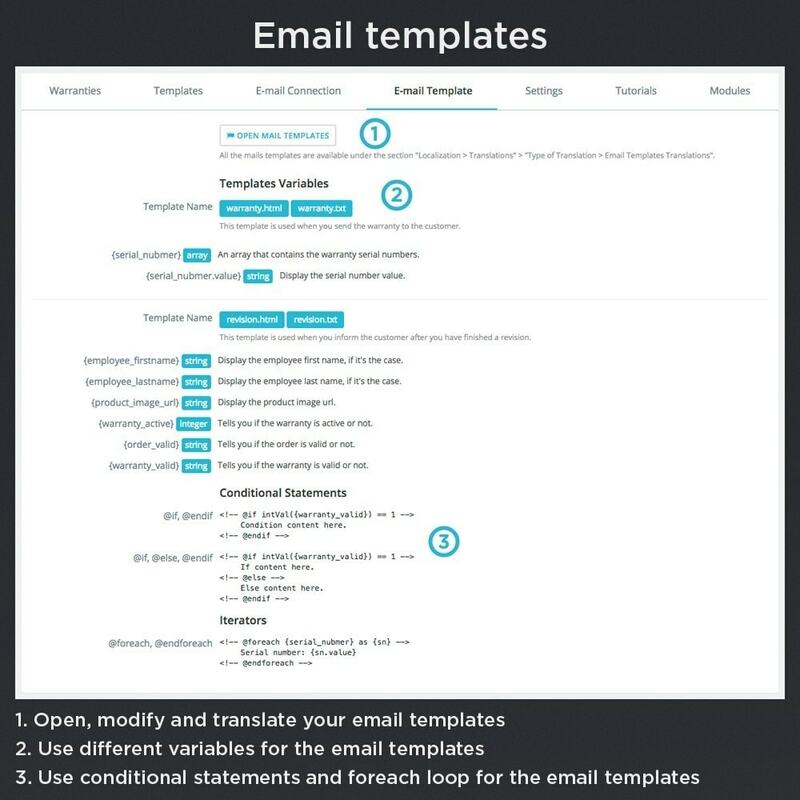 The templates supports multiple variables, conditional statements and foreach iterator. Enable / Disable Multiple shops Templates - Make the templates available for multiple shops or not. Enable / Disable PDF Preview - View or not the warranty PDF preview under the edit product section. Enable / Disable Allow Message History - Allow customer to view the messages history. QR Code link - Point the QR Code link to the Front-Office warranties list, or point it to to the warranty details. 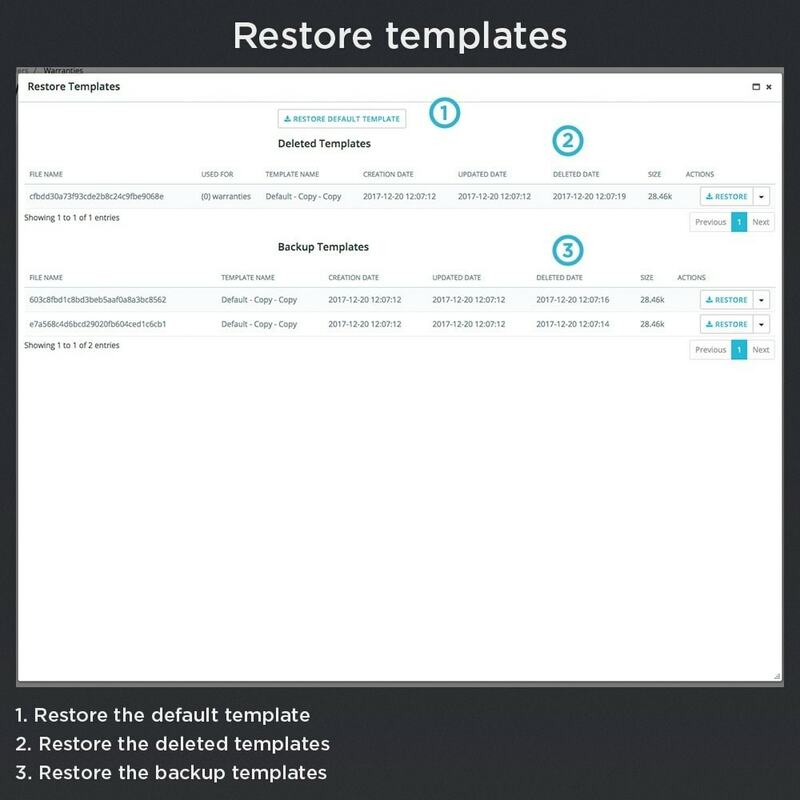 Restore Templates - Restore the default template, restore the deleted template or restore the backup templates. Delete messages attachments - Free up the server space by cleaning all the attachments associated with the messages. Just need to upload the module .zip file into the Prestashop Back-Office. And documentation and installation guide is attached.